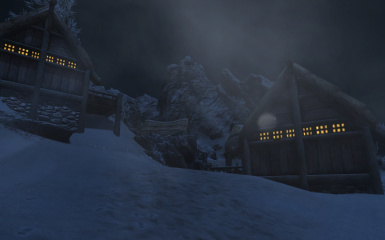 A village in the mountains southeast of the city of Dawnstar. Tamriel has had many villages on maps for as far back as anyone can remember. What happened to them all? Nobody really knows. This mod is simply my take on bringing one back from Elder Scrolls: Arena. 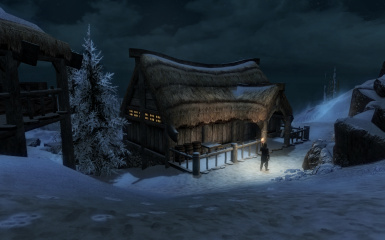 Helarchen Creek was a small village in the game somewhere in the mountains near Dawnstar. Originally it appears as though Bethesda planned to put this around the Nightgate Inn, but then changed the name on that and cut the content. Some further research using old Arena maps placed the village further north anyway, so here it is. * Two of the NPCs can be married and will optionally share their homes with you. * All added houses are radiant quest enabled, so you may get Companions missions and anything else that's properly configured to use NPC homes for quests. * LOD has been generated for the area. Skyrim Special Edition 1.5.73 or greater. DO NOT extract the contents of the BSA file into your Data folder as loose files, or let your mod manager perform an equivalent function on the contents of the file. Doing so will cause things to load in the wrong order and break the game. Skyrim is intended to load a BSA alongside it's ESM/ESP file. Circumventing this causes issues which I will not provide support for. If you insist on going against this advice, you will receive no support for the problems you generate as a result of this. Drop the archive into your Skyrim Special Edition Mods\Bash Installers folder, then install as usual. Make sure the mod is active in the Wrye Bash mods tab. 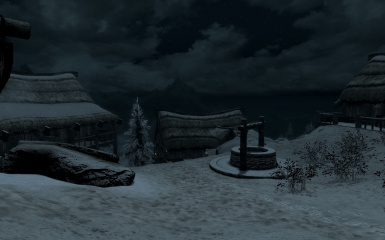 Use the "Download with Manager" button on the Helarchen Creek page at Skyrim Nexus. The installer should take care of things from there. Then simply make sure NMM has the mod activated. Drop the Helarchen Creek.esp, Helarchen Creek.bsa, and Helarchen Creek - Textures.bsa files into your Data folder. Activate the mod using whatever management tool suits you. Due to the nature of Skyrim mods, especially those adding scripts, it is strongly discouraged to attempt uninstalling a mod from your active game. Any mod that is more than pure mesh or texture replacements has the possibility to leave behind permanent changes to your save that you may not want. This is not something modders can correct for. It is how the game was designed by Bethesda. No support will be provided for anyone who uninstalls this mod from an active game and continues on with that save. To remove the mod: Delete the Helarchen Creek.esp, Helarchen Creek.bsa, and Helarchen Creek - Textures.bsa from your Data folder. Then reload your game as usual. LOOT (https://loot.github.io/) should be used for optimal placement. MUST be loaded after Immersive Citizens to preserve navmesh integrity within the village. Redistribution is strictly forbidden without prior consent. This means do not upload it anywhere unless you have obtained permission from me. 1. All mod files contained in this archive are retained with their current names. 2. No alterations are made to the contents of the plugins or master file other than those necessary to translate the English text. 3. No alterations or additions are made to the meshes and textures other than those necessary to translate English text. 4. This readme is included, in ENGLISH, exactly as it is written in the version it was downloaded with. 1. Permission must be obtained from me in advance. There will be no exceptions to this. 2. The documentation for the patch must mention that I am the creator of this mod. 3. The documentation for the patch must contain a link back to one of the download sites listed at the top of this readme. 4. You are solely responsible for any support issues arising from the use of the compatibility patch. All inquiries regarding this mod must be directed to me. If after 1 year contact cannot be established or you have not received a response, stewardship of this mod will fall to the community at AFK Mods (www.afkmods.com). I can be contacted via PM at Bethesda Game Studios Forums, TES Alliance, NexusMods, AFK Mods, and The Assimilation Lab under the username Arthmoor. A good faith effort must be made before assuming that contact cannot be established before concluding that I am no longer maintaining this mod. Mod history archives such as Morrowind Mod History are permitted to keep a copy of this mod within their archives for historical purposes provided all authorship and credit information is retained and the contents of the mod are not altered in any way. This mod is not made, guaranteed, or supported by Zenimax, Bethesda Game Studios, or any of their affiliates. Fixed a bug with the investment option at the apothecary shop. Navmesh cleaning with new versions of xEdit. Added a smelter at the blacksmith and extended his AI radius so he'll use it on occasion. Generated LOD for the village. Fixed faction settings for the blacksmith so his shop would be functional.